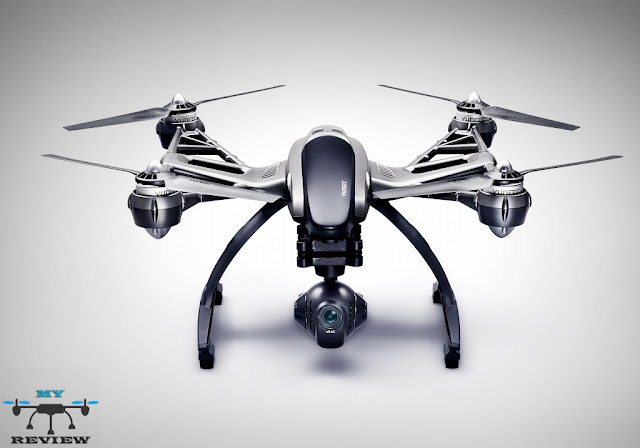 The Yuneec Typhoon Q500 4K is the newest member of a big family of consumer (and professional) drones. It boasts similar specs to the much-lauded DJI Phantom 3. Unlike some of its competitors, Yuneec’s consumer drones are not only approachable but downright enjoyable to fly, regardless of your experience in the drone arena. There was a time when the idea of getting a 4K-ready drone for a price that didn't require you to remortgage your home was the stuff of a madman's dreams, but the rapid advancement of this particular field of gadgetry means such opulence is now well within the grasp of even casual aerial photographers. 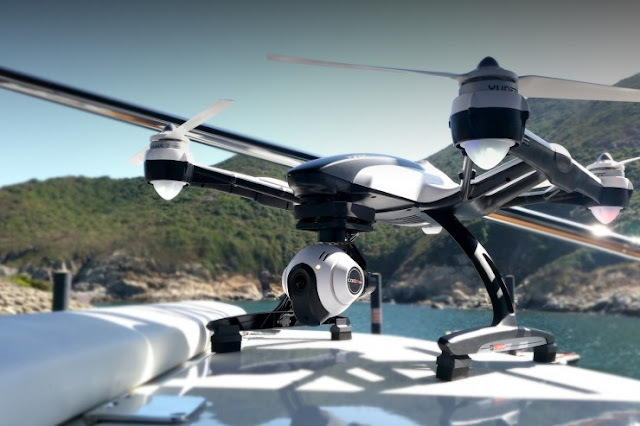 Drones like the Yuneec Typhoon Q500 4K are paving the way for a low-cost revolution by offering professional-standard video recording that doesn't cost the earth. The Q500 4K captures excellent footage, comes with a wide range of extras and is easy to get in the air – and it offers all of this for a fraction of the cost of its more famous rivals – with some caveats, of course. One of the very first things we noticed after removing the drone from its mammoth of a case was its superior construction and sturdy frame. Outfitted with a strong, sturdy body and heavy-duty arms, even the drone’s legs prove to be incredibly stable which isn’t always typical with crafts of this kind. Unlike some of its more expensive rivals, the Typhoon Q500 4K has a lightweight plastic chassis to keep costs down. This means the drone is more likely to incur serious damage in a collision, but for those shopping on a tight budget the trade-off is likely to be acceptable. The top half of the drone is dominated by its four rotors, while the 4K gimbal-mounted camera sits directly underneath. Batteries are loaded into a compartment on the rear of the unit, and two helicopter-style skids protrude from the bottom, complete with soft foam pads to ensure a comfortable landing. There are five lights on the Q500 4K – one on the underside of each rotor, with a fifth light on the rear so you can see which way the drone is facing when it's in the distance. 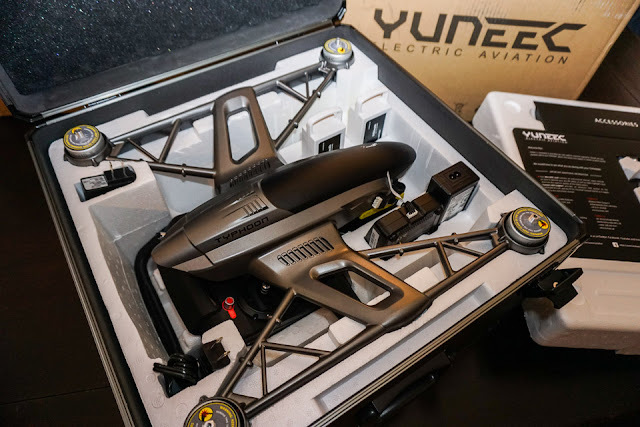 Yuneec’s Q500 had us feeling like a kid on Christmas morning as we unpacked it. 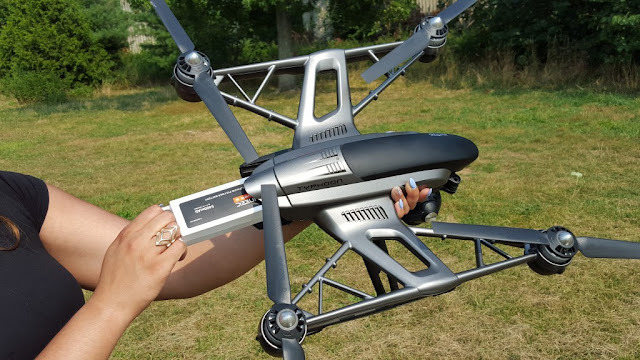 Roughly 16.5 inches long and standing just over 8 inches tall, the Q500 weighs just under 4 pounds with the battery and payload both attached. Out of the box, the drone comes with two sets of rotors, all necessary plug-ins and adapters, a 16GB SD card pre-loaded with tutorial videos, the ST10+ Personal Ground Station controller, and a built-in 4K-capable camera. Easy to use yet sophisticated, the Q500 grants even amateur photogs the ability to produce professional-grade images and video. The fully controllable 3-axis gimbal camera can shoot straight ahead to capture the horizon, or pivot up to 90 degrees down to capture overhead footage. Though many newer drones are beginning to add this feature, it’s still relatively new to the field, giving the Q500 a leg up on its competition. Aside from its optical fortitude, the drone packs two unique autonomous modes to give beginner pilots a hand. “Follow Me” mode essentially tethers the craft to the pilot (the one holding the controller), allowing it to operate completely on its own. “Watch Me” mode fixates the camera directly on the pilot, continuously keeping the operator in the frame of view and in focus regardless of which way the drone flies. In other words, Yuneec makes life very easy on you, if you want. The ST10+ Personal Ground Station controller, included with all versions of the Q500, houses all the necessary joysticks, buttons, and settings necessary for everything from flying and landing the drone, to activating its features and capturing photos or videos. Outfitted with a crystal-clear, 5.5-inch color touchscreen, the ST10+ gives you a front row seat to exactly what the drone sees as it flies. Though much of the screen is dedicated to a live video feed, pilots also receive constant updates on the craft’s battery life, its altitude and distance from the controller, ground speed, and GPS status, among several others. The camera that comes with it shoots 4K/30fps, or 1080p/120fps for nice slow motion. It also snaps 12 megapixel photos. One feature that I was super excited about is that the camera is a “no distortion” camera. That means that you won’t get any of the fisheye look that you would get in a GoPro, and that also means that you won’t have to take the time in post to correct it. 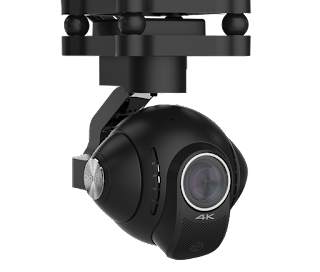 Unlike other brands, the Typhoon 4K also comes with a 3-axis gimbal attached to the camera standard. (Editor’s note: the resolution is actually UHD, which is just a little smaller than 4K, but just barely). This camera is connected to a 3-axis gimbal, which works like a charm. The camera, unlike other cameras from certain manufacturers, can be disconnected and removed from the drone, which leads me to believe that if Yuneec creates a new camera, we could possibly use it on the drone to replace this one. Also, if you somehow crash and break your camera, you could easily switch it out for a new one. Setting up the Typhoon Q500 4K for flight is about as simple as it gets. Spin on the props, charge up the batteries for the drone and controller and you're done. The controller, which is running on Android, takes a minute to boot up and then, once you've turned the drone on, it takes another minute for the two to finish connecting. GPS satellite acquisition -- required for hovering in place and return-to-home among other things -- takes a little more time. All told, it took me about 3 to 5 minutes until it was ready to fly, basically depending on how fast I could lock onto more than six satellites. There is no automatic takeoff, but the procedure is simple enough: Press and hold a button on the controller to set the motors spinning and press up on the left stick. There is also no automatic landing, though you can just switch to Home mode and it will land for you. Honestly, other than bouncing a bit when it's close to the ground, the Q500 4K is stable enough for beginners to take off and land without issue. As long as it's locked onto plenty of satellites, flying is easy. It's not particularly zippy, but that's kind of a plus when you're learning to fly for smooth camera movements. It is remarkably quiet, too. Yes, you'll still hear it, but it's more like the sound of a fast-spinning fan than an electric leaf blower. A single 5,400 mAh lithium-polymer battery grants roughly 25 minutes of sustained flight time, something we documented while keeping the drone hovered in just one position. After giving it more of a workout by moving it around and shooting video, flight time sank slightly to roughly 20 to 21 minutes. Furthermore, when flying consistently in “Follow Me” or “Watch Me” mode, the battery lasted just shy of 20 minutes. As much of a downer as it is to have to stop enjoying the Q500 after just 20 minutes, an extra battery allows you to get the drone right back up into the air. Luckily, the included controller spells out current battery voltage, remaining capacity, and gives several alerts when it starts to get low. Though it’s ideal to begin landing the craft once the initial low battery warning appears, you don’t need to really start panicking until it dips below 10.7V. When it’s time to actually charge the batteries (which, sadly, must occur right out of the box), expect to wait roughly two hours before it reaches its full charge capacity. Because waiting two hours to enjoy just 20 minutes of flight time can’t possibly excite anyone, the two-battery option of the Q500 is highly recommended. An included car charging adapter gives the drone some added flexibility, if you can’t make it home to use the wall charger. The included ST10+ Personal Ground Station requires a bit more patience when its juices reach zero. It took us nearly five and a half hours of charging before the controller displayed full capacity. You can use the AC adapter, or a standard USB power source with the included micro USB cable. The Yuneec Typhoon 4K may not have as many features as some of the leading drones on the market, but its lower price point will be particularly attractive for novice aerial photographers. Thanks to some useful accessories and a solid feature set, the smooth-flying, easy-to-use Yuneec Typhoon Q500 4K quadcopter is a compelling package for video and photos in the sky or on the ground. The design is a little rough around the edges, and if you want autonomous flight features like waypoint navigation, you're out of luck. Q500 4K's size isn't travel-friendly. If you’re looking to capture professional-looking aerial video without the professional price tag, the Q500 should definitely be on your radar. The built-in 4K camera easily rivals some handhelds, and the simple controls allow you to focus more on filming and less on flying the drone. All things considered, this is one of the best quadcopters you can get for just 699.00$. I have read many blogs but your blog are always very nice and now here I got some detail about the drones camera Good work keep it up.